The much-anticipated annual celebration for foodies, Miami Spice, is coming to a close on Sept. 30. But, you still have time to gather your meat-loving squad and head over to Fogo de Chão AKA carnivore heaven! If you haven’t tried authentic churrasco, get ready for some serious deliciousness as this churrascaria serves up the best Brazilian-style barbecue outside of Southern Brazil. A wide variety of the finest cuts of meats are seasoned, skewed and roasted over an open flame on a churrasqueira grill, and Fogo de Chão stays true to this centuries-old traditional Gaucho cooking technique. Boy do we have unlimited love for all this unlimited meat! Roaming gaucho chefs, dressed in full garb, use gigantic swords to skillfully carve fresh slivers and chunks of glistening meat from the metal skewers right onto your plate. The warm setting is inviting: flaming fireplace, wide-open room, dark wood panels, soft lighting. And, the high level of attention and non-stop feast of high quality eats is just as welcoming. Here’s a tip: South American wines under $100 are half price on Wednesdays! The onsite wine cellar, a temperature-controlled room visible from the dining floor, holds almost 200 bottles - 30 of which are also offered by the glass. “We’ve recently started offering 8 higher end wines available in 3 and 6 ounce pours using our Coravin systems. These include wines like Don Melchor, Silver Oak and our newest addition VIK, a red blend from Chile,” said Burgos. 1. Considered Brazil’s national cocktail, order the Premium Caipirinha. It’s a perfectly balanced “tart meets sweet” cocktail made of distilled alcohol cachaça, lime and sugar served on the rocks. Fogo de Chão bottles its own all-natural, award-winning cachaça in their home state of Rio Grande do Sul, and it’s aged for two years. 2. Unlimited appetizers? Yes, please! The Market Table is a thing of beauty, and they encourage you to visit it as often as you wish. Here you will find an abundance of fresh goodness from charcuterie, salads, and fruits to vegetables, tabbouleh, homemade soup, and even an oversized Parmigiano Reggiano cheese wheel. 3. Facing the Market Table is the Feijoada Bar, which is also unlimited. Feijoada is a hearty Brazilian stew made of black beans, dry sausage pork and beef. It’s served over white rice, and topped with golden-colored farofa – a toasted cassava/yucca flour. Comfort food at its finest. 4. Want more unlimited? To accompany your churrasco, servers continuously bring typical Brazilian plates to your table: warm pão de queijo (cheese rolls), polenta frita (fried polenta) and banana frita (sweet fried plantains). YUM! 5. Order your bottle of wine before indulging in all the meats about to come. 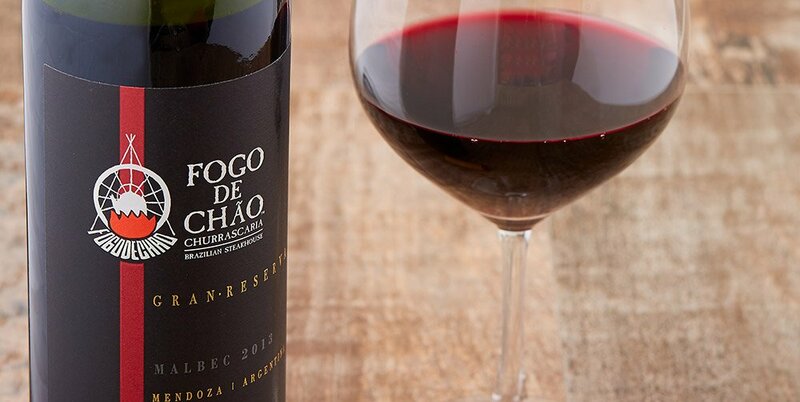 Fogo de Chão’s Gran Reserva house Malbec is made by the iconic Viñedo Zuccardi in Mendoza. As Malbec is the region’s most celebrated grape, this choice delivers a velvety texture and beautiful color. “The Zuccardi winery produces world-class wines, and the dark fruit flavors of this wine richly mingle with the well-marbled cut of savory steak,” added Burgos. 6. Now, onto the unlimited meatapalooza! The Picanha, seasoned with sea salt, is beef top sirloin with a thick layer of fat. OMG. 7. The most prized cut of beef, Picanha is also served here with garlic. The moist, decadent flavors explode in your mouth. 8. Alcatra, which is top sirloin, is thinly sliced with an intense beefy taste. A low fat, high protein steak made for grilling, it is perfection. 9. Fraldinha (bottom sirloin) is tender, and all about distinctive texture and strong marbling. 10. Medalhões com Bacon is legendary, and we can’t think of anything more savory than this bacon-wrapped steak. Enough said. 11. Switching lanes to lamb, the Cordeiro lamb steak is glorious. Have some more, if you’d like! 12. We can eat the Cordeiro leg of lamb all day. 13. The Lombo, a pork loin filet encrusted with a thick parmesan cheese coating, needs no further introduction. 14. Speaking of pork, the Costela de Porco baby back ribs easily fall right off the bone and into your mouth. 15. One of our favorites, the Bisteca de Porco pork chops are succulent, succulent, succulent. 16. The smoke cured pork sausage, Linguiça is tangy with a little kick. You’re welcome. 17. Frango is delectable chicken breast wrapped in crispy bacon. Every bite is moist smoky, and peppery. 18. The well-seasoned Frango chicken legs are equally juicy, and equally tasty. 19. Hope you made room for dessert! The classic chocolate mousse cake, with its airy layers upon layers, is a whole lot of creamy goodness. 20. Last but not least - the New York cheesecake (topped with a sweet strawberry drizzle) is a standard that never disappoints. Fogo de Chão is perfect for a business gathering, family reunion, date night, or just catching up with friends. You won’t soon forget this memorable experience! Fogo de Chão, 836 1st Street, Miami Beach, FL 33139. For reservations: (305) 672-0011.